Fill in your details below and we will let you know within 24 hours if we can get Fuji to you with haste! 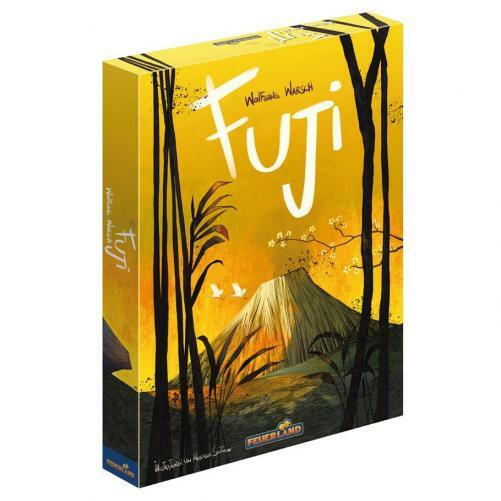 In Fuji, you play as a group of adventurers on their way to Japan's most famous volcano. Mount Fuji. But just before you arrive at your destination. the earth begins to shake and the volcano erupts! Now, your group must escape the deadly lava flows as quickly as possible to reach the safe village. In this cooperative dice game, players simultaneously and secretly roll their dice behind their screens in each round. During the game, you must find the best way across a number of terrain cards to the safe village for each player. Each terrain card has a given dice requirement. You can move to a card only if you match this requirement better than both your neighbors, but since you know only your own dice and can communicate only vaguely, you will need both skill and luck to save yourselves.